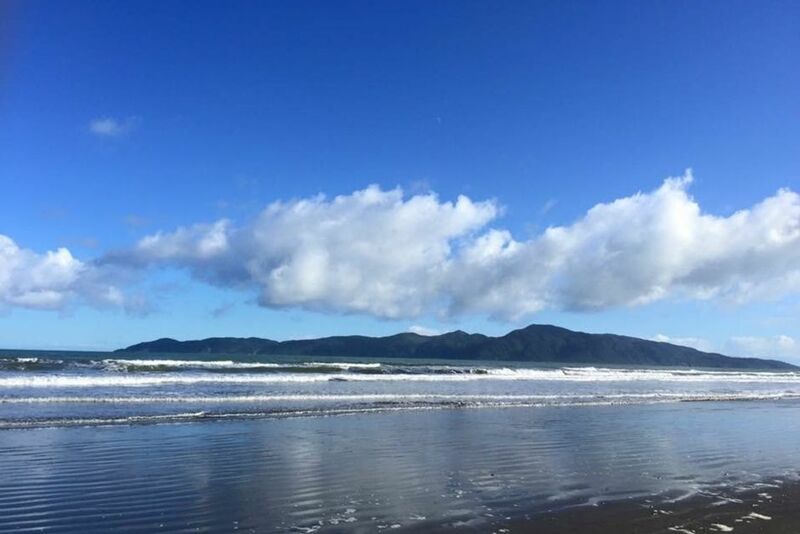 Raumati is synonymous for its safe swimming, fishing and its great Cafes. Add an expansive beachfront property with all its amenities and comforts of home and you have the ideal recipe for your family's next unforgettable holiday experience. 40 min drive from Wellington, 10 min to Lindale farm and handy to Raumati Village, it has beautiful views of south island and Kapiti island. Three living rooms provide ample space for relaxation and open onto a huge timber deck - just perfect for outdoor living. Four bedrooms (main-ensuite) and living areas easily accommodate 14, maximum of 18. A bigger group can be accomodated with the help of the flat downstairs which can sleep an extra 6. PS: Please don't forget to pack the boogie-boards and sea kayak. We are glad to announce the Super Special for WEEKDAYS stay at our Bach beginning this Easter. The rental per night will be only $300 for 4 people and $30 per adult and $25 per child thereafter. Please note that this is for minimum 2 nights' stay and if the stay is in continuation with weekend then normal rates will apply for the weekend. Kids are okay but not toddlers. Smoking outside the house permitted. Two nights minimum stay during weekends. Three nights minimum stay during the long weekends and New Year. The rate mentioned is for a family of four or for upto 4 adults. Per adult / child per night additional. Discount offered on week+ stays. Linen supplied on request at an additional charge. This is such a beautiful house. Ten of us went in the end, and found it so pleasant in every way. It is well located, a short walk from shops, beach and restaurants. The view is breathtaking. Fantastic location with magical view. Fantastic location with magical view. It would be nice to have a little beach at the front but that is quibbling as you can easily walk up to the beach area. Garden and deck made for delightful outdoor enjoyment. Close to shops etc yet sufficiently far away for this to feel like a real holiday home, even though it is really very close to Wellington. Stunning location, beautiful home. Few bits and pieces a bit tired and needing a bit of love but our wh?nau love this place and keep coming back year after year. Thanks Uday. Beautiful holiday home in great location and spectacular sea views. Beautiful holiday home in great location and spectacular sea views. Enjoyed our stay apart from some things that needs to be attended to; communicated to caretaker and the owner.